The E 150.1 is a high performing pressure washer that easily handles any dirt in an effective way. 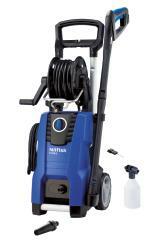 With high pressure and water flow the cleaning efficiency is high and reliable. Perfect for cleaning (horse) trailers, boats, swimming pools, sand blasting and it can of course also be used for patio and garden furniture cleaning.